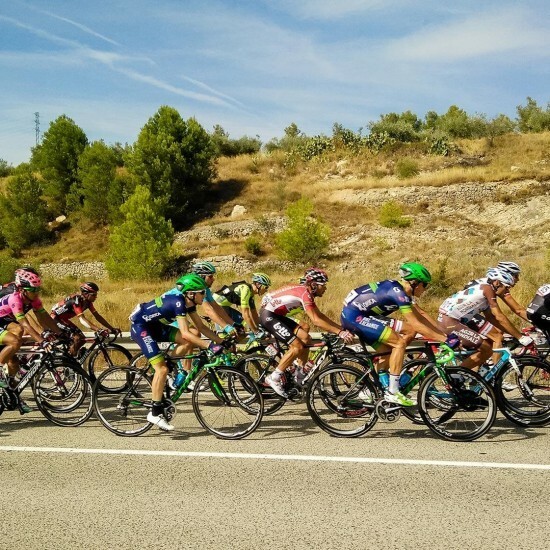 The 74th edition of the Vuelta a España will take place between 24 August and 15 September 2019, setting out from Salinas de Torrevieja and ending in Madrid. 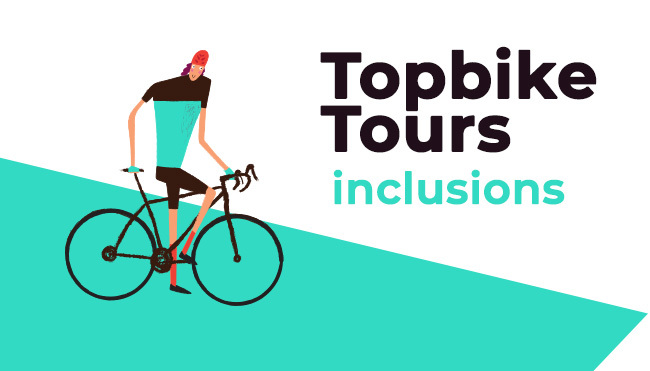 Our 2019 Topbike Tour of Spain (Vuelta a España) Itinerary is now available! 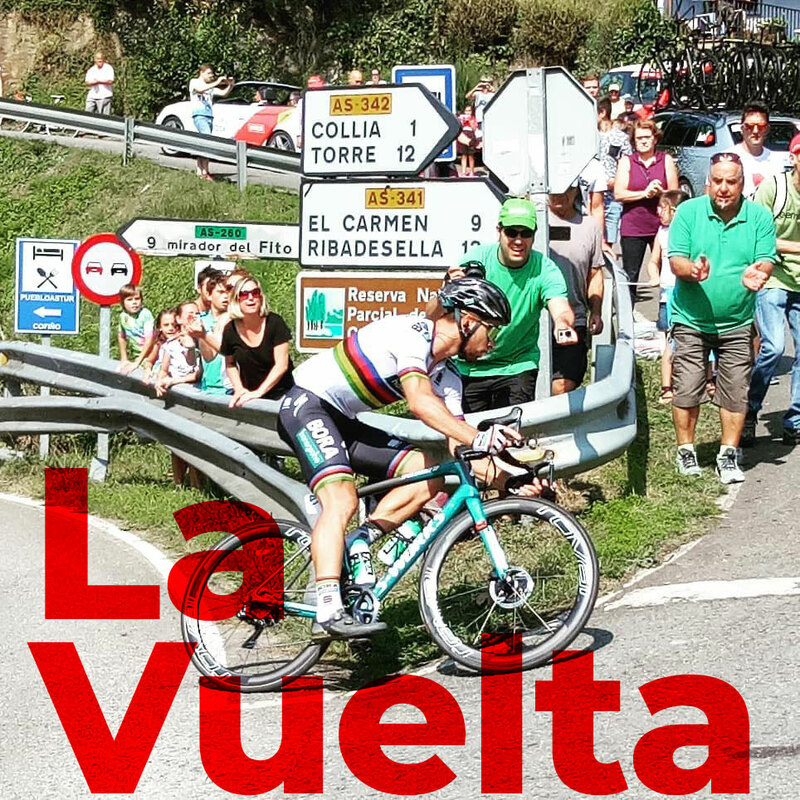 La Vuelta 19 route has been announced and while it’s not high on the priority list of many riders at this time of the season, by the time it starts, it can often produce the best racing of the year. From Bilbao in the Basque country down to Madrid, we’ll chase this enigmatic grand tour all the while experiencing the best riding northern Spain has to offer. 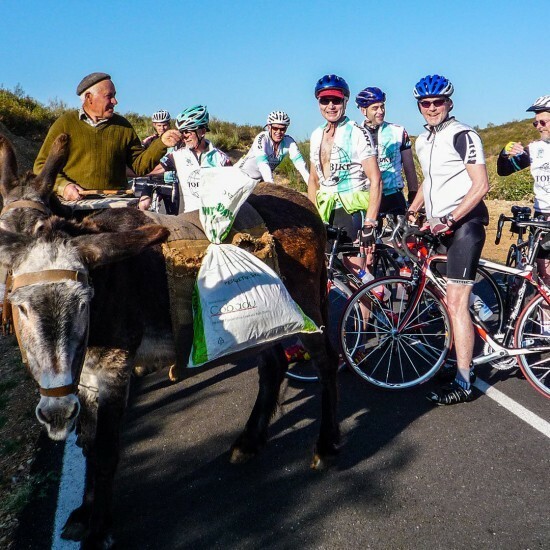 First up there’s a stage start in Bilbao, and then we move westwards through Cantabria to Asturias, before heading south for the grand finale in downtown Madrid. You’ll love the northern coast of Spain, the Basque region, not to mention the seafood, wine, coffee and tapas. 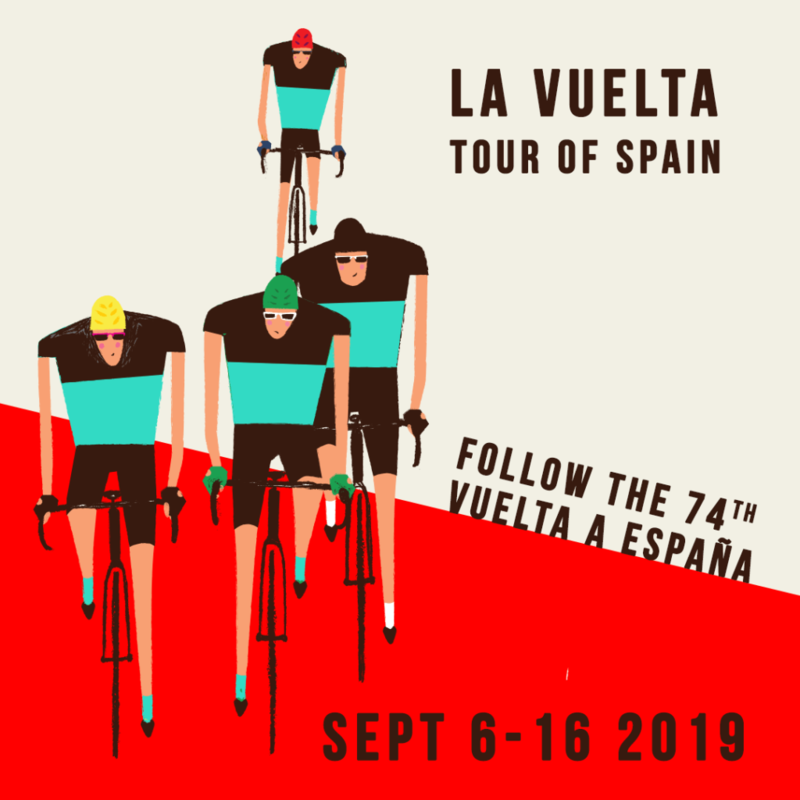 Following the final 10 stages of the 74th Edition of the Vuelta a Espana, from Bilbao finishing with an exciting stage finish in Madrid, Spain. 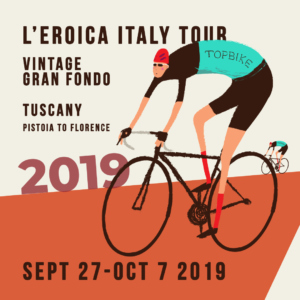 This is a fantastic event, where you can really get in touch with these world class riders. We ride most mornings, encompassing parts of the stages the riders will be competing on. We get to see the riders signing on, race starts, sprints, climbs and finishes. We ride most mornings, kicking off with a full sprinters (flat) stage then the best parts of the following two mountain stages. 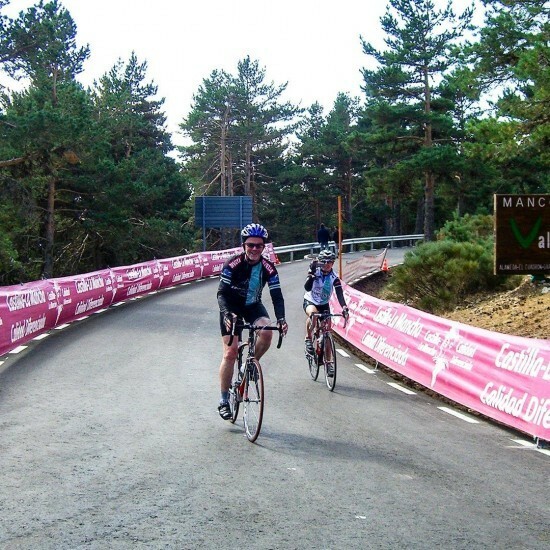 We’ll then enjoy some great riding in the north of Spain, before watching the final stage in Madrid, including a pre-brekky ride around the CBD. Our last nights are, of course, in Madrid where we’ll finish with a degustation menu, tapas style, in a famous old bar. 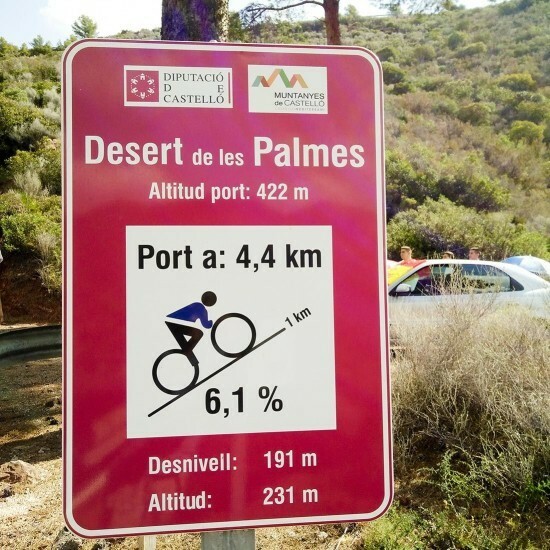 Rides will average 70-90k+ along with >1000m vertical each day. 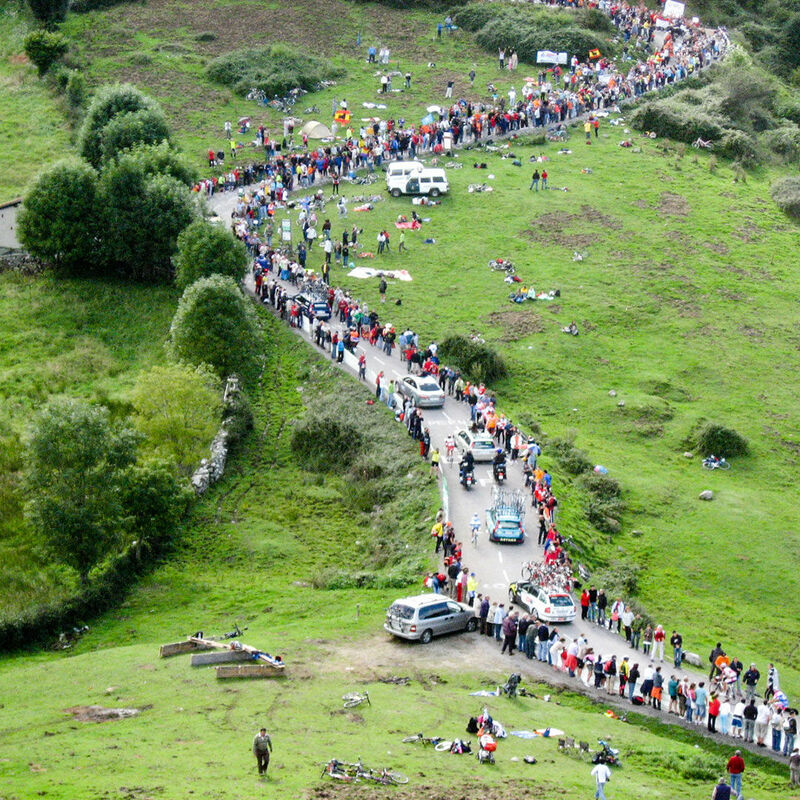 After pick up in Bilbao, we’ll watch the stage start near the centre of town. Once the race has commenced its circuitous route, we’ll get on our bikes and ‘straightline’ it to the bottom of the final climb, about 95k with <1500m ascent. Cross your fingers, because in a perfect world, we will see the race three times. The start, mid-stage and commencement of the final ascent to the hilltop finish. 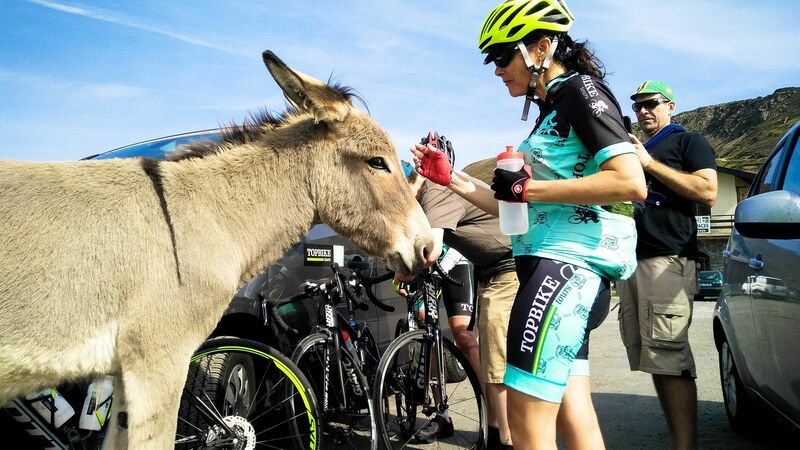 Post race we’ll be in the Topbike vans heading to our hotel at San Vicente de la Barquera. Here we’ll once again be close to the start of tomorrow’s stage. Terrain: From sea level we spend 40k making our way to the top of the first hilltop of 300m. Another 15k gets us over the 2<sup>nd </sup>and to the top of the 3<sup>rd </sup>peak, at just over 400m. From here it’s another 40k to our final destination, which is at just 250m above sea level. Today is our day to have a crack at riding a full stage. It’s a biggie, at 189k, but as the highest point on the course is just over 300 metres, it is considered a flat stage. We are by the coast for the first three quarters of the day, so it’s a scenic route, but as there are a lot of small climbs, over this distance they can all take their toll. Not far from the start we can ‘straightline’ a small diversion in the parcours, and cut off 25k. It may be advantageous to make use of this small shortcut early in the day. 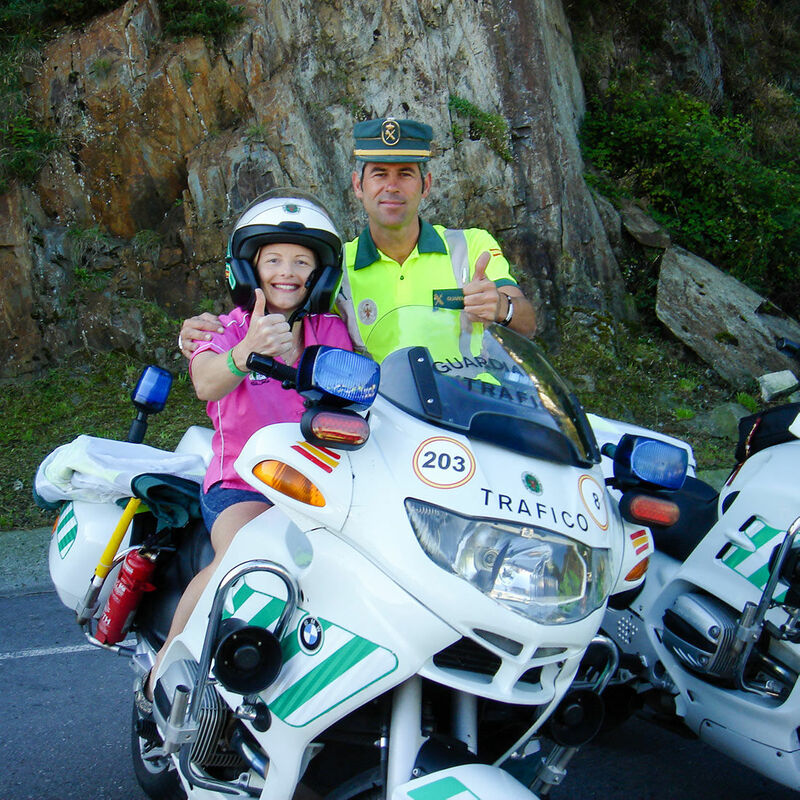 All going well, we’ll arrive in Oviedo ahead of the peloton, and get to enjoy the sprint finish. Post race we’ll be re-locating to a small coastal town, not far from the start of the next two stages, and just 60k from Oviedo. Cangas del Narcea is our destination today. 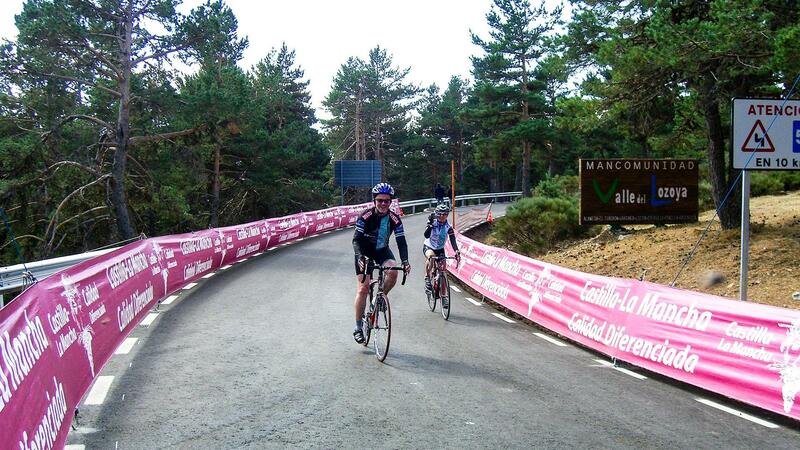 Not only is it at the base of the final climb, but the race passes through it twice, earlier in the stage. It’s 85k from our hotel, if we take the flatter route, or 75k for the more direct and hillier passage. One to call on the day. 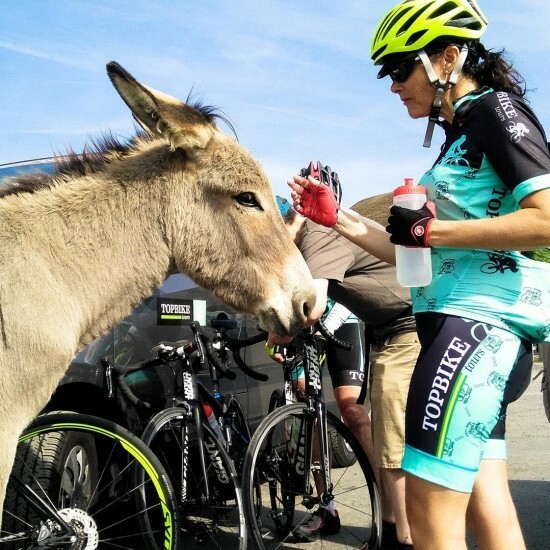 Once we’re in Cangas, we’ll make ourselves comfortable in a bar, and watch the caravan, police, the peloton, and the complete circus, pass us by, three times. Or, for the keen ones amongst us, there is always the final climb to conquer. Return back to our coastal town in the Topbike air-conditioned vans. Today’s stage has four passes, all close to one thousand metres vertical, or higher, including the hilltop finish. Terrain: Gentle climbing all the way, with one bonus bump to enjoy, around the 50k mark. Today we’ll be moving inland, and moving house, with a ‘ride out – ride in’ format. We’ll start by riding through the town of Pravia, where today’s stage starts. From here we’ll follow the stage route, over its first three KOM’s until we leave it, to turn off towards our accommodation. Our total ride distance will be nearly 110k’s, with the middle 80k being along the stage course. There is a shorter, flatter, option available today (approx 75k) if anyone would like to eschew the race parcours. We’ll either watch the race start, and follow. 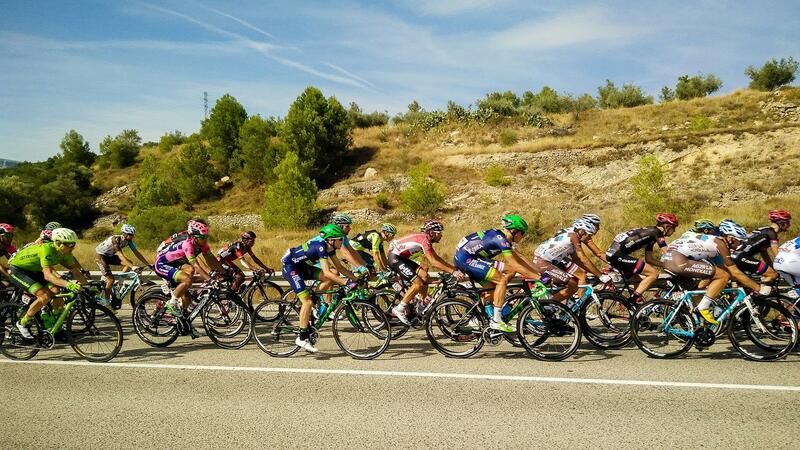 Or we can jump ahead of the peloton and spectate where they catch us, or at our corner, where we leave the race route. This will be another one to call on the day. Rural hotel, with a spa, in the mountains, surrounded by forest. 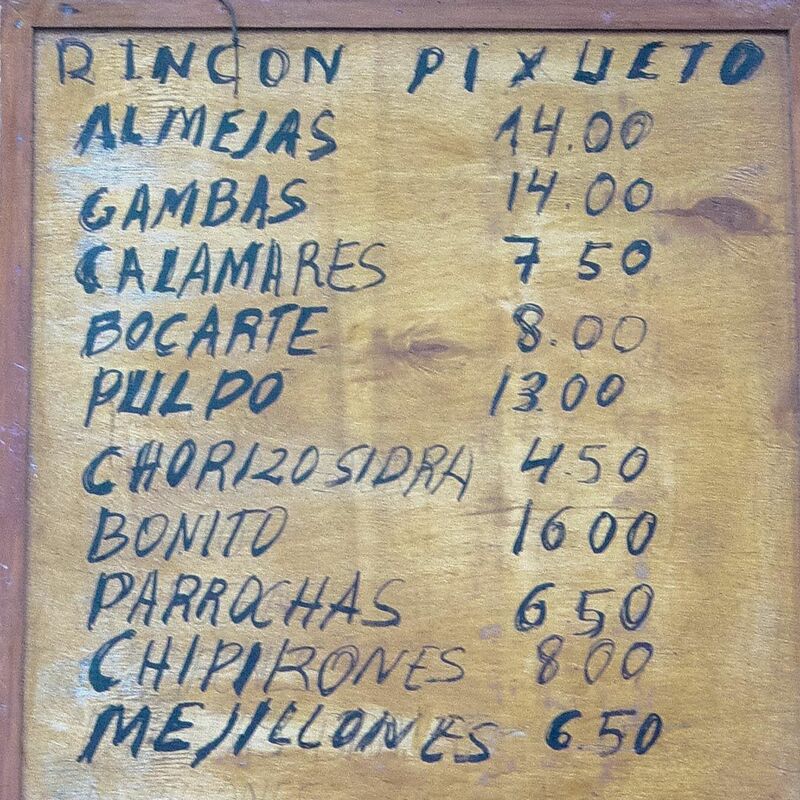 Local restaurant, with mountain cuisine. Terrain: Three different climbs, with peaks ranging from 500m to 350m, to 1100m. 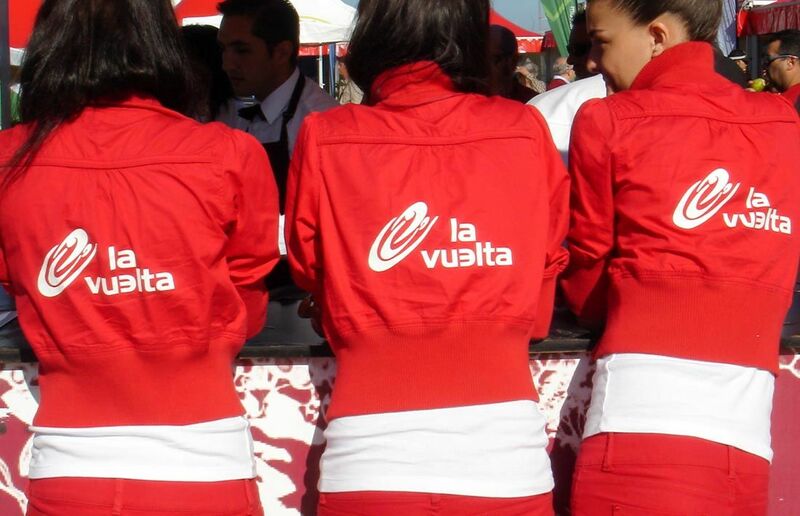 It’s a rest day for La Vuelta, as they transport south towards Madrid. 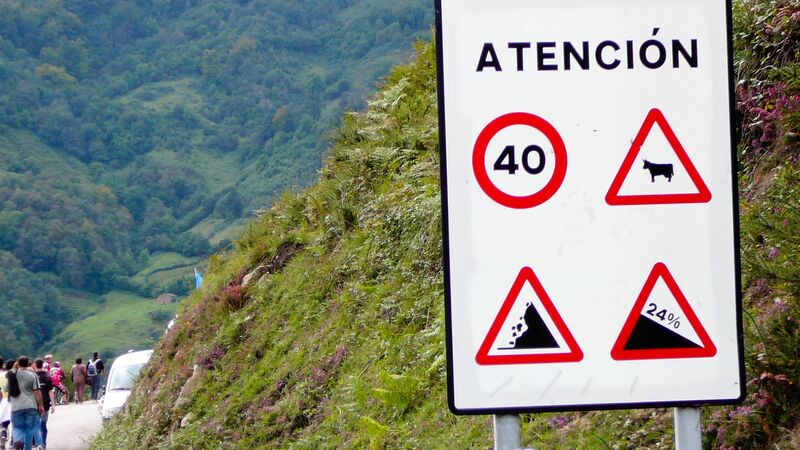 We’re taking the opportunity to ride the infamous climb of Angliru. We’re about 50k from the base, so you can use the full distance to warm up, or catch a ride in the van to as close to the climb, as you wish. There is no race to view today, so we do have all day for riding. Today we can transport home, from the bottom of the climb, in the Topbike Vans. Terrain: Starting at 500m, it’s nearly a downhill run to the base of Angliru, apart from one little climb, that takes us back up to 500m. Angliru peaks at 1570m, the overall ascent being 1266m, and the steepest gradient hits 24%. 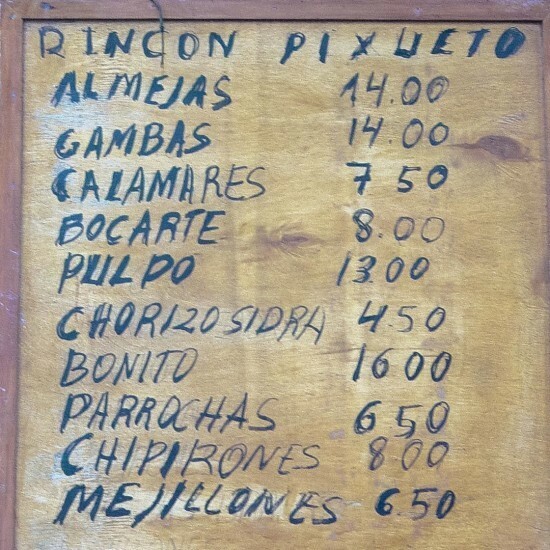 Today we’ll ride out of Hotel Alesga all the way east to our next location, in Arriondas. 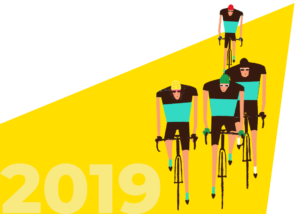 With this ride we’ll cover the final half of 2018 stage 14. This will take us over three big climbs (1200m, 850m and 500m), finishing with a long downhill. Alternately we can choose a more sedate route, that misses all of those climbs, tops out at just 500m (lower than our starting place) and is just under 110k. Not forgetting we’ll catch the final of today’s stage, on the tele in a local bar. Spanish hacienda style ‘Casona’ near the centre of town. Ride: Option 1: < 144k, 2600m vertical asc. Ride: Option 2: < 110k, 1300m vertical asc. Today we ride up to Lagos de Covadonga, which hosted the finish of not only Stage 15 in 2018, but many other stages of La Vuelta over the years. 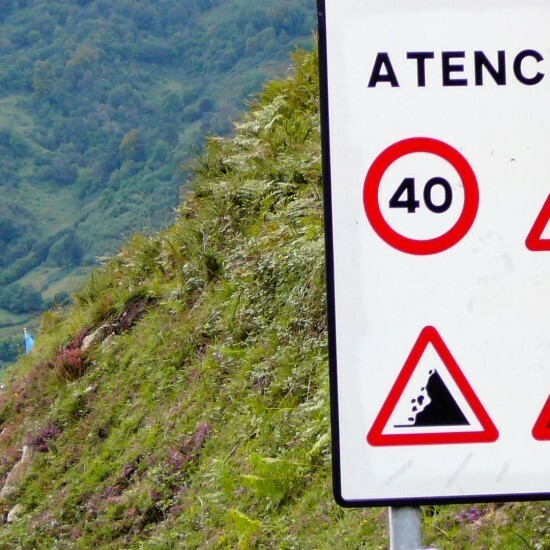 This climb belongs to the Picos de Europa and Cantabrian Mountains, and is surprisingly similar (in specs) to Alpe d’Huez, although situated near the coast, and starting from just above sea level, it does not peak as high. Starting from Soto de Cangas, the Lagos de Covadonga ascent is 16 km long. Over this distance, you climb 1056 metres. The average percentage thus is 7.4 %. Picnic up the top, home early afternoon, watch the bike race in the hotel lounge, or make our way to a local bar. 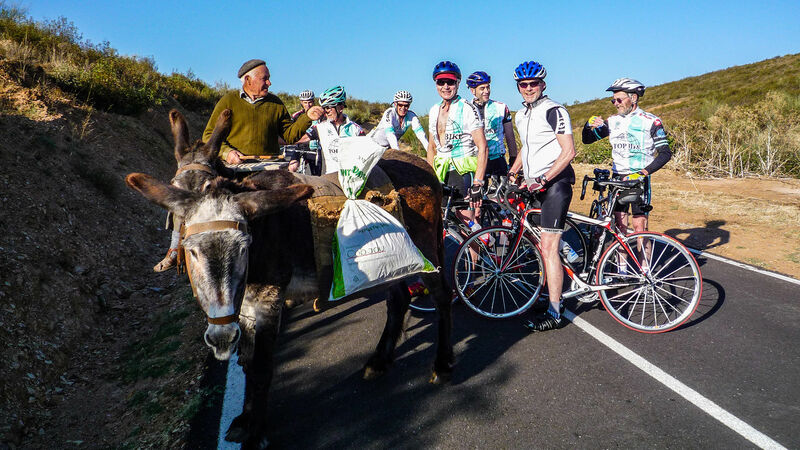 Today we have time to get out and ride an 85k loop that takes us out to the coast, to enjoy a bit of sea air, before turning inland and returning to our town over the range ‘Picos de Europa and Cantabrian Mountains’. We’ll clear three different peaks, the highest one not exceeding 500 metres. Plenty of ‘cut and run’ options available today, if required. We’ll have a picnic on the road, and once back in town, we can freshen up, and take a seat in a nearby bar, watch the race on the tele. 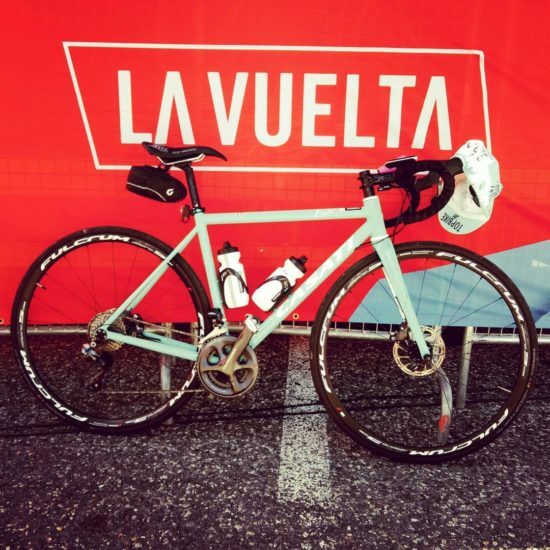 Terrain: Three small climbs, all with spectacular views, and a couple of bumps to finish. Today we’re off to Madrid, and we’ll commence the journey by riding south out of Arriondas, up into the high northern plains of Spain. Out our total of 110k, the first half will take us on a gentle climb up to 1200m. For the remaining half we stay up at that level. We’ll be riding right through the heart of the Regional Park of Picos de Europa, past alpine lakes and different forests. Exiting the park we’ll have a picnic in Guarda and here we’ll rack the bikes to finish the remainder of the journey, into central Madrid, in the comfort of the air conditioned vans. Excellent ristorante, within walking distance. Ride: < 110k, < 2000m asc. Terrain: Up the valley, heading south. One big climb, followed by a couple of bumps. We’ll be up early for a ride around Madrid, just to get our bearings, and have a look around before the locals get active. 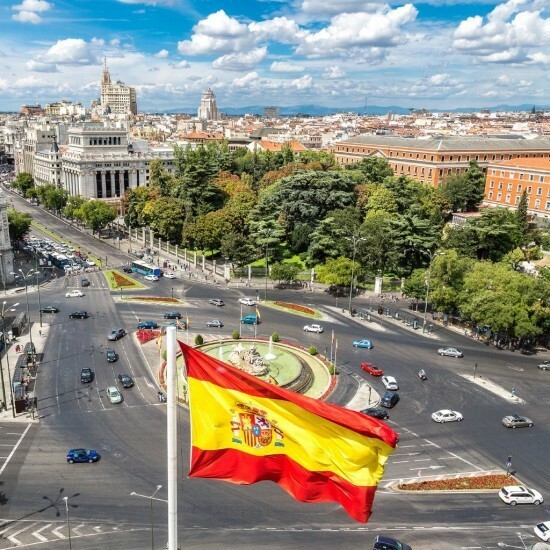 We won’t have to be super early, the sun won’t rise until 8… So we can spend a little time, maybe take a coffee in Plaza Mayor, maybe even a typical Spanish donut dipped in chocolate. We’ll have a second breakfast back in the hotel, and still have time for a little sight-seeing before the race arrives in downtown Madrid. There is also the unique possibility to see the stage start AND finish. The stage start is not far away, just 28k from our hotel, so we could also ride out there, before returning to watch the stage finish in the CBD. 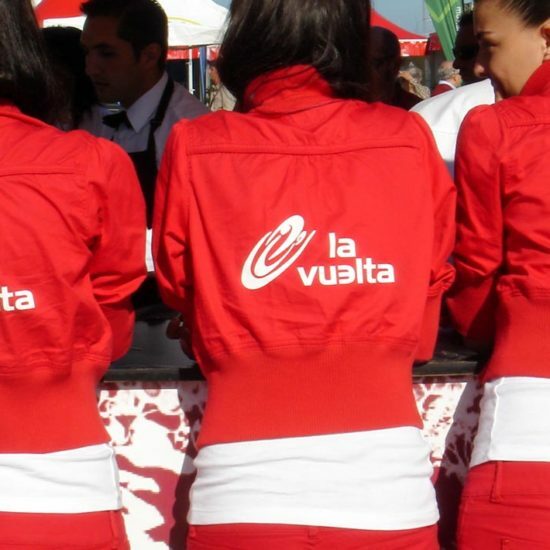 Back in town we’ll get to see the final laps of La Vuelta, as they finish with multiple laps of a street circuit. Here the sprinters have one last time to shine, on the final grand tour stage of the year. Dinner tonight in a famous old tapas bar, walking distance from our hotel. Excellent tapas bar, within walking distance. After breakfast, packing up bikes and luggage, we’ll be on the road. Unless other plans are made, our final farewells are at our hotel. Adios amigos! 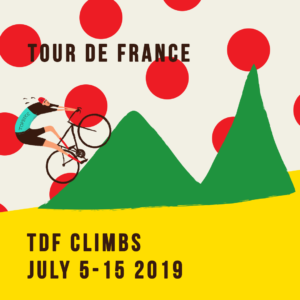 If we do everything planned, there'll have been: Five Days of race viewing, incorporating 2 stage starts, 2 hilltop views, 1 feedzone and 3 roadside views. We'll also have ridden about 7-900k, and climbed many mountains. 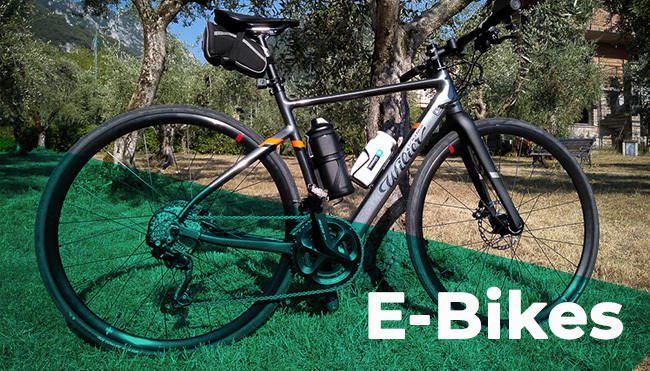 If you did the largest option of everything outlined above, you will have completed nearly 1000k, with almost 19,000m of climbing, that’s really only for the totally obsessed…! Included in your tour is all transport from Bilbao to Madrid for you, your bike and one bag, accommodation, all breakfasts and all dinners. You will also receive a full 5 piece Topbike kit. 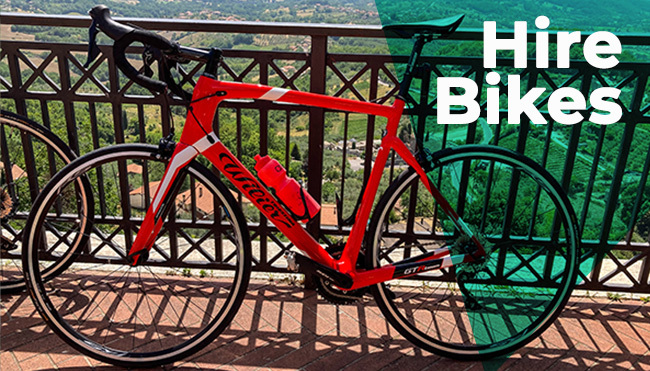 Also included are your experienced and knowledgeable guides, maps, training tips, coaching (if required) and mechanical back-up for your bike. Please also see our recommended list of things to bring. We’ll pick up in Bilbao and move west for a one night stopover in a coastal town, San Vicente de la Barquera (Cantabria). From there it’s two nights in an old seaside port of Cudillero, and two nights in a hotel deep in the Asturian mountains, before spending three nights in the centre of a small town (Arriondas) close to the Asturian coast. Our last two nights are in central Madrid where we’ll finish with a degustation menu, tapas style, in a famous old bar.